SiargaoSunrise is located on Siargao Island in the Philippines. A National Geographic Traveler magazine article in December 2015 describes the Philippines and Siargao as one of the top 20 places to vacation in the world. 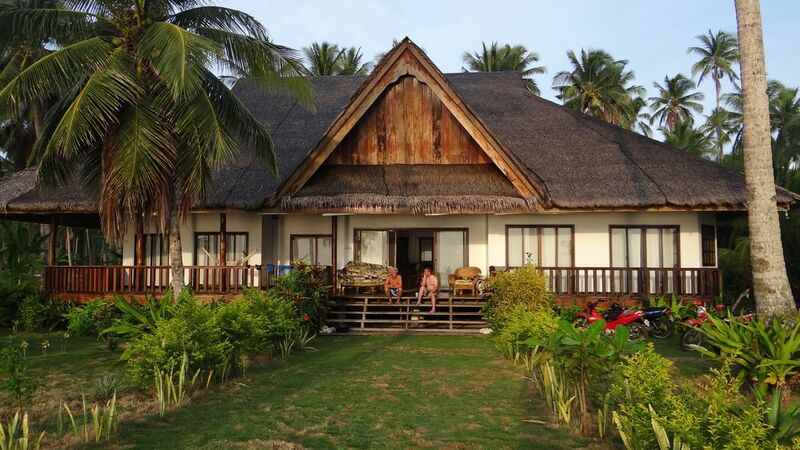 Our house is on the beach in an idyllic tropical setting and has modern amenities. The views from the expansive deck and both bedrooms are of the blue Pacific with an array of beautiful sights nearby. I was born in the Philippines but have lived most of my life in California where I reside in the North San Diego Coastal town of Solana Beach. I enjoy traveling with friends and family and experiencing different places not only for their physical aspects but for the culture and the people. I love meeting people and firmly believe that we are more alike than we are different. I have traveled throughout the world to experience a surfing lifestyle. I traveled often to the Philippines because it is my homeland but also because I was constantly looking for new surfing spots. I first traveled to Siargao Island in 2001 and ventured to the little surfed area to the north. I discovered the property which I now own and was enthralled by it. It reminded me of the areas around Kauai, Hawaii which is one my favorite spots in the world. But this area has much more to offer than surfing. The people are friendly, the food is mostly fresh and the natural beauty is inspiring. The Northern part of Siargao is still largely untouched by major development, which has now taken place in the southern areas of the island. Our area is quiet and less crowded. Most of the attractions here deal with enjoying nature and interacting with the local people. For surfing there are a very wide variety of surf breaks in the area and they are challenging with far less people in the water. There are numerous water related activities like snorkeling, fishing and diving. The ocean and beach are visible from all points in the house, including the two bedrooms and the living room and dining area. There is a very large veranda which has lounge sofas and chairs. Our house is steps away from a golden sand beach. The reefs in front are ideal for surfing and when there are no waves, snorkeling can be quite good. Water heaters in both showers. Two kitchen areas, one for main cooking and cleaning and another smaller area in dining area for additional cooking and cleaning. The main attractions are ocean and beach related. Siargao island has one of the largest mangrove systems in the world and the Sohoton National Park is a beautiful example. Island hopping is a popular tourist attraction as the water color and sea life in the area is very unique. The area is internationally known for game fishing and world class surfing. Rates are based on two persons. Each additional person shall be charged an additional $ 25 per night per stay. Maximum 6 persons. Longer terms may be discounted according to length of stay and number of person in party.